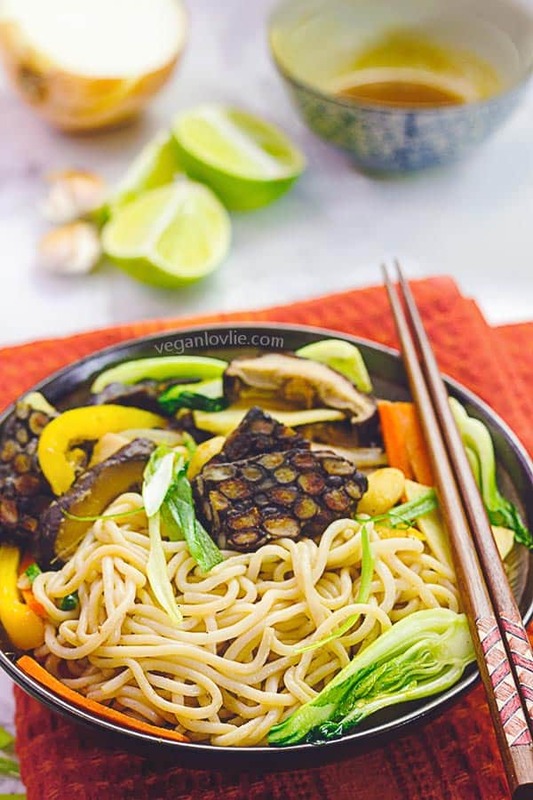 Scrumptious vegan recipes, all things crafty & lovely. 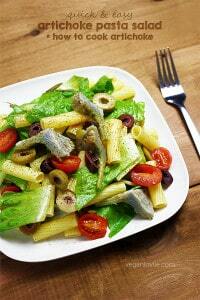 An easy artichoke pasta salad recipe made with fresh artichoke hearts. If using jarred/preserved artichokes, this pasta salad can be made in about 15 minutes, just about the same time the pasta takes to cook. Unspared by the heat wave during the past couple of weeks, we really had our appetite quite low. Fresher lighter meals were all the more alluring. I also happened to see some gorgeous fresh looking artichokes at the fresh produce market last week and couldn’t resist dropping a couple in my bag. 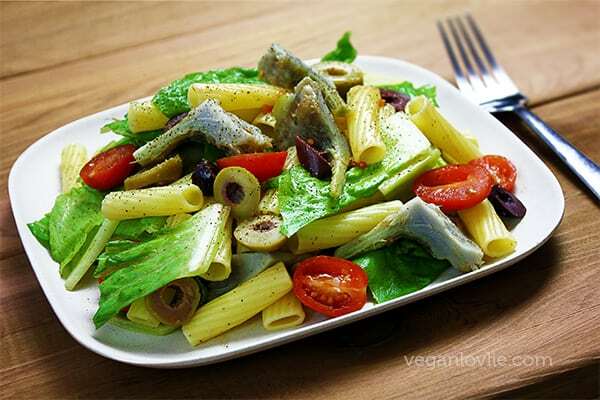 Kevin and I decided to use the artichoke heart in a pasta salad, one that we usually have every so often, whenever we want an easy meal that can be filling as well. This artichoke pasta salad really comes together very quickly, just about the time the pasta and artichokes take to cook. Meanwhile, you can use the time to chop the vegetables and once the pasta is done, it is just a matter of tossing everything together. The taste of fresh steamed artichokes is really something else, but you can most certainly substitute fresh artichokes with canned or preserved artichokes in jars, for a quicker or more convenient option. 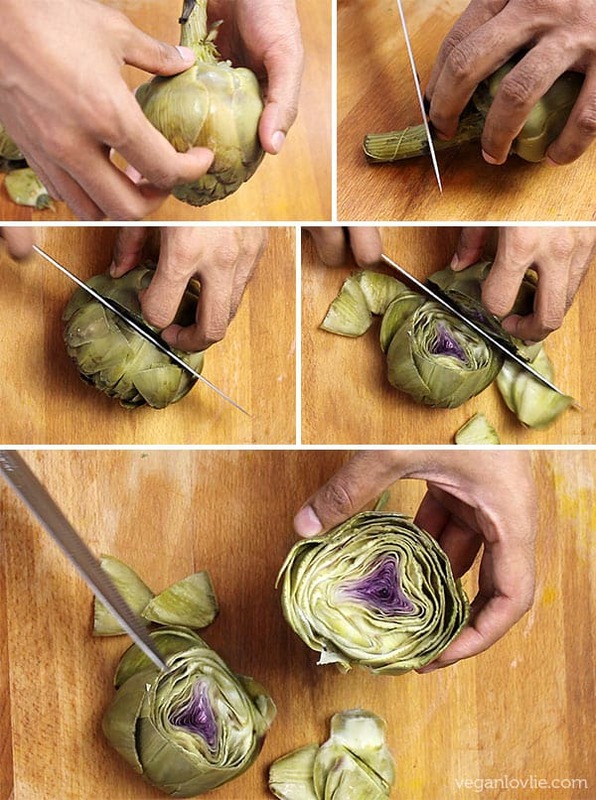 In this recipe, only the heart of the artichoke is used. So, we just munched on the fleshy part at the base of the petals while preparing the salad. Quite addictive, if you ask me, even though we did not have them with any dipping sauce. What the video for how to make this easy Artichoke Pasta Salad and how to cook fresh artichokes. Cook the pasta according to the packet instructions. Once pasta is cooked, drain the water. Rinse in cold water immediately to stop the cooking process and to cool down the pasta for the salad. If you are using fresh artichokes, steam them until the outer petals are easy to pull off. This can take around 20 minutes or more. Then leave the artichoke to cool. While pasta and artichoke are cooking, you can prepare the vegetables. You can chop the grape tomatoes, romaine lettuce and olives in any way that you like. Once artichoke is cool enough to handle, begin by removing the outer petals and keep aside to eat with your favourite dipping sauce. Trim off the stem but leave around 5 cm or 2 inches attached. Then trim off the top part ⅔ of the way down starting from the top. Then continue to remove the petals until you reach the fuzzy part which is called the “choke”. This fuzzy part is not edible, so remove it. 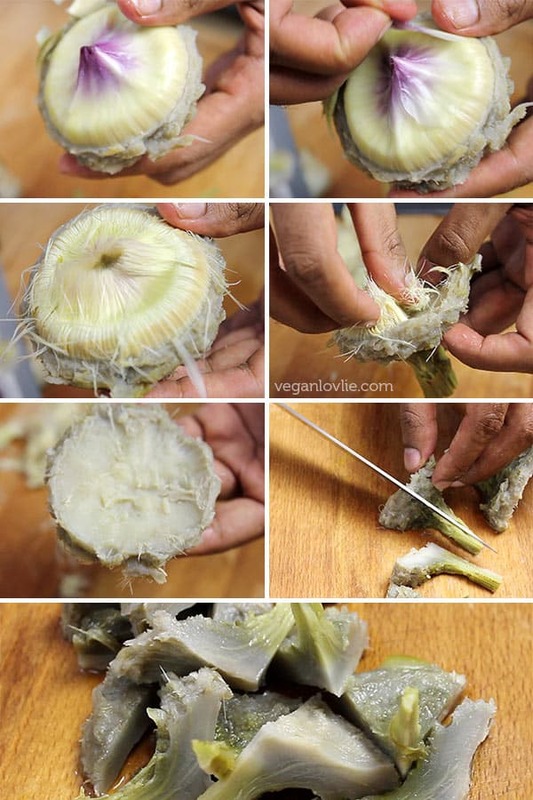 Then rinse off the artichoke heart in some cold water to remove any fibres that may be clinging to it. Cut the heart into small pieces and add it to the salad bowl. If using preserved artichokes instead, just add them in at this point. Add the olive oil, red wine vinegar, salt and pepper to taste. 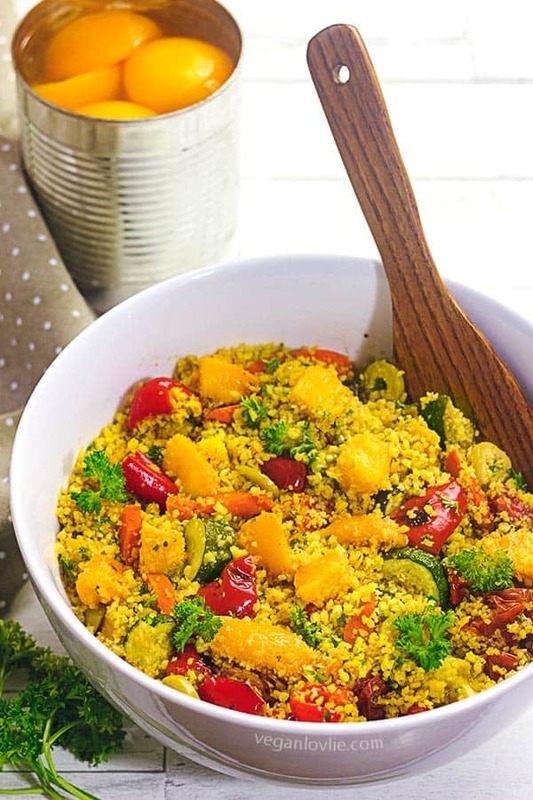 Toss everything together well and serve or chill for about 30 minutes before serving depending on your preference. Then continue to remove the petals until you reach the fuzzy part which is called the “choke”. This fuzzy part is not edible, so remove it. 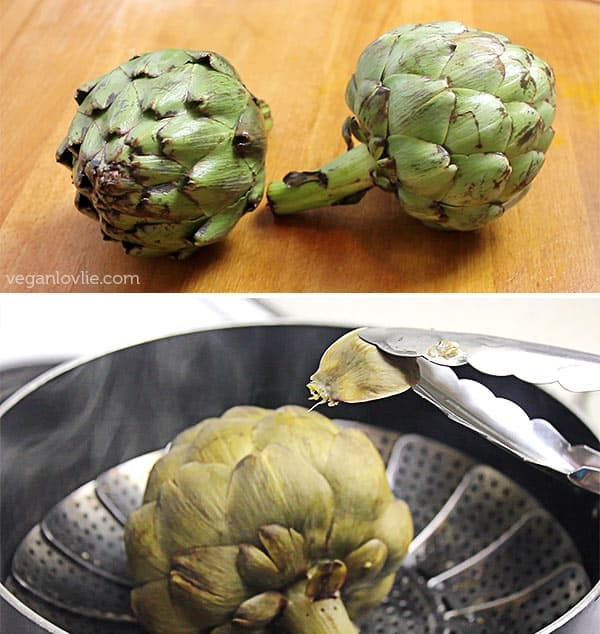 Then rinse off the artichoke heart in some cold water to remove any fibres that may be clinging to it. Cut the heart into small pieces and add it to the salad bowl. 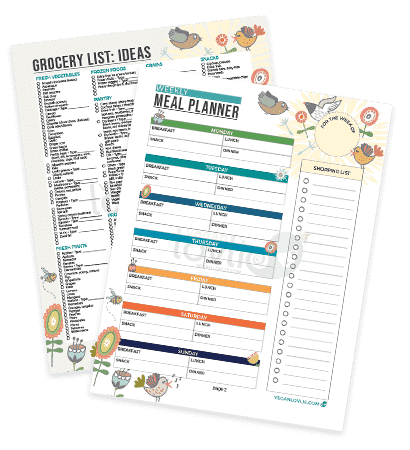 Subscribe for updates from the blog and YouTube channel and receive a free meal planner as a thank-you gift! Check your email after subscribing to download your free planner. All content, photos, recipes and videos © Teenuja Dahari and Kevin Mangaroo (unless otherwise mentioned). If you would like to share our content, please share photos (without cropping or editing out our watermark) and a small description with a link back to our original post. Please do not share/republish entire recipes (ingredients and directions) or large bodies of text, edit our photos in any way without our written permission. Social media share and directly embedding our YouTube videos (via the YouTube embed code) are always welcome. Thank you. Please read more about our copyright notice in the Contact page. Copyright © 2019 Veganlovlie. All rights reserved. 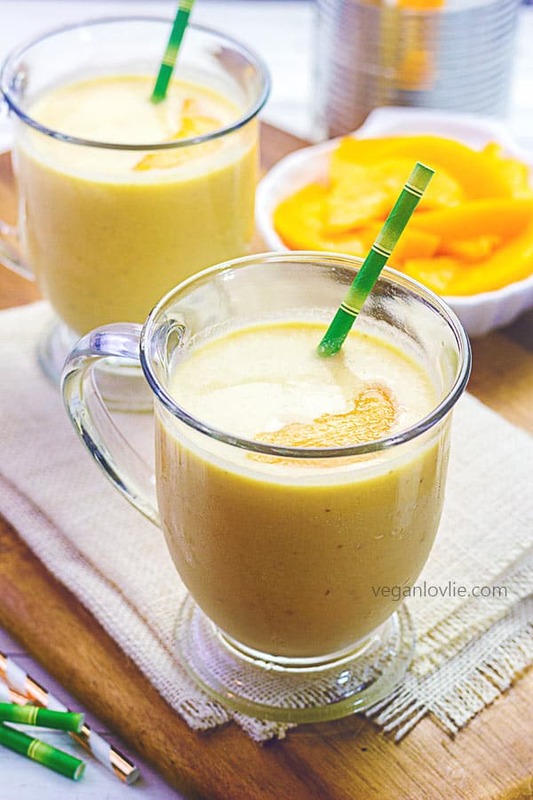 error: If you would like to print the recipe, please do so from the printable recipe card below.